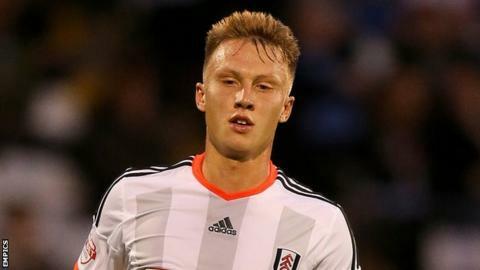 Fulham striker Cauley Woodrow denied Huddersfield Town their first victory of the season with a 95th-minute equaliser at Craven Cottage. The hosts almost took a first-half lead but Dan Burn's effort was well cleared off the line by defender Joel Lynch. The Terriers scored after Nahki Wells linked up with Harry Bunn and Wells tucked the ball past Andy Lonergan. But Fulham earned a point in added time when Burn flicked on to Woodrow, who calmly volleyed the ball into the net. Kit Symons's side came close to taking the lead before the break when Burn nodded Jamie O'Hara's corner goalbound, but Lynch scrambled to clear the ball off the line. Huddersfield keeper Joe Murphy kept the scores level with a terrific save after O'Hara's free-kick teed up the advancing Moussa Dembele for a header. Huddersfield took the lead against the run of play when Bunn's ball allowed Wells to slide the ball in. But Fulham claimed a point in dramatic fashion when Burn knocked the ball down to set up Woodrow to volley in. "I understand the frustration from the supporters, they can get restless, but I also know that from hard times you have to show some character to get better. "The first goal was going to be key, but luckily we got back into it. Hopefully that's the result that will get us going now this season. "We've lost games this season and should have got more out of them, but we've got to keep going. Our form needs to be a lot better." "I've got to say my players were excellent. Our positivity in the second half got us our just rewards with the goal after a stalemate in the first half. "Fair play to Kit and his players though, they kept going and even though we made some good blocks and clearances we've conceded an equaliser. "It really hurts, it feels like a defeat because it would have been the perfect away performance with a clean sheet and three points." Match ends, Fulham 1, Huddersfield Town 1. Second Half ends, Fulham 1, Huddersfield Town 1. Goal! Fulham 1, Huddersfield Town 1. Cauley Woodrow (Fulham) right footed shot from the centre of the box to the bottom left corner. Jazz Richards (Fulham) wins a free kick in the defensive half. Corner, Fulham. Conceded by Joe Murphy. Attempt saved. Tom Cairney (Fulham) left footed shot from outside the box is saved in the top right corner. Substitution, Huddersfield Town. Martin Cranie replaces Nahki Wells. Foul by Kyle Dempsey (Huddersfield Town). Attempt missed. Moussa Dembele (Fulham) header from the centre of the box misses to the left. Assisted by Tom Cairney with a cross following a corner. Attempt blocked. Lasse Vigen Christensen (Fulham) right footed shot from the left side of the box is blocked. Corner, Fulham. Conceded by Mark Hudson. Attempt saved. Harry Bunn (Huddersfield Town) right footed shot from a difficult angle on the left is saved in the bottom left corner. Assisted by Nahki Wells with a through ball. Attempt missed. Moussa Dembele (Fulham) header from the centre of the box misses to the right. Assisted by Jazz Richards with a cross. Substitution, Huddersfield Town. Kyle Dempsey replaces Jacob Butterfield. Attempt missed. Moussa Dembele (Fulham) header from the left side of the six yard box is too high. Assisted by Ross McCormack following a set piece situation. Tom Cairney (Fulham) is shown the yellow card. Jason Davidson (Huddersfield Town) is shown the yellow card. Mark Hudson (Huddersfield Town) is shown the yellow card for a bad foul. Substitution, Huddersfield Town. Ishmael Miller replaces Sean Scannell. Attempt blocked. Tom Cairney (Fulham) left footed shot from outside the box is blocked. Assisted by Ross McCormack. Attempt missed. Mark Hudson (Huddersfield Town) header from the left side of the six yard box is just a bit too high. Assisted by Jason Davidson with a cross following a corner. Corner, Huddersfield Town. Conceded by Ross McCormack. Delay in match Andy Lonergan (Fulham) because of an injury. Attempt saved. Sean Scannell (Huddersfield Town) header from the centre of the box is saved in the bottom right corner. Assisted by Harry Bunn with a cross. Andy Lonergan (Fulham) wins a free kick in the defensive half.